The DanceSyndrome team love to visit schools and we are an Artsmark Partner for those schools working towards Artsmark accreditation. DanceSyndrome is an inclusive dance charity that aim to use dance to empower individuals of all ages and abilities. We can help all of our participants to develop vital life skills like increased confidence, independence and resilience, and empower them with the skills needed to be successful leaders. All our dance activity is led and informed by people with learning disabilities. We use a model of co-delivery which empowers Dance Leaders with a learning disability to lead dance sessions with a qualified Dance Artist to support them. This unique style of delivery promotes inclusion in every aspect of life, challenges perceptions of disability and promotes our ethos of focusing on “ability, not disability”. Our work inspires and empowers both dancers and audiences to believe that opportunities are endless for people who refuse to be defined by disability. Inspiring assemblies which share important messages about Equality and Diversity, community and philanthropy. Creative dance workshops which encourage positive health and wellbeing, teach transferrable life skills, demonstrate how we can use dance to communicate our ideas and feelings and also get young people to think about how they can actively work towards inclusion and an “ability, not disability” mindset. Dance By Example is a unique dance leadership training programme which we deliver to adults with and without learning disabilities to enable them to gain a level 1 qualification. This can be adapted to be delivered to Key Stage 4 students. 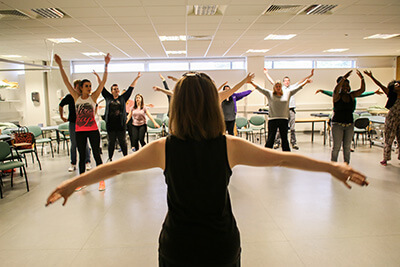 Our unique Dance By Example leadership training will empower your staff to feel more confident about delivering inclusive dance themselves as part of their teaching role. Inclusive Approaches training will enable your staff to think in a more inclusive way about all aspects of school life – not just dance! We understand that budget can be a barrier for many schools and we will work with you to make sure that you get good value for money. We discuss possible fundraising activities that could help you to raise money to cover the cost of our activities. We can also look at the potential to deliver to clusters of schools to help you to share costs. DanceSyndrome is proud to be working in partnership with schools and settings on their Artsmark Award journey. By supporting Artsmark settings, we’re helping put the arts at the heart of education, inspiring young people to create, experience and participate in high quality arts and culture.